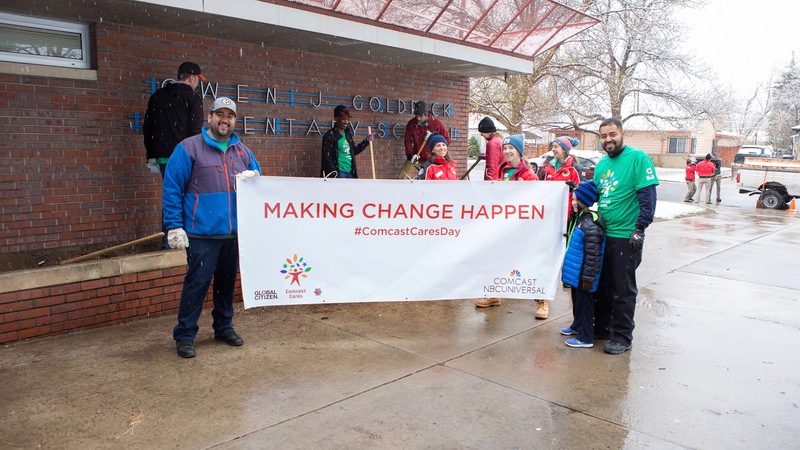 Across Colorado, 5,000 Comcast employees and family members marked the 17th annual Comcast Cares Day on April 21 by completing revitalization and beautification projects at facilities, schools and community centers serving our local neighborhoods. Employees and their families worked alongside community partners and even some clients who will benefit from the projects that took place. In addition, volunteers in Colorado were part of a significant milestone – reaching 1 million volunteers since Comcast Cares Day began in 2001! Comcast Cares Day is more than just a day – it is a celebration and opportunity to spotlight our year-round commitment to volunteerism that began with our founding 55 years ago. From using technology to create positive change, such as teaching digital literacy skills and wiring community centers and libraries, to mentoring youth, to beautifying parks, Comcast NBCUniversal employees volunteer on this day, and throughout the year, to make a lasting impact. Colorado projects included a skills-based training class helping a group of 9th grade girls from Girls Inc. of Metro Denver prepare for summer internships, a painting and deep-cleaning project at Paragon Learning Center in Pueblo and a beautification and landscaping project with Putnam Elementary School in Fort Collins. See a full list of this year’s partners, and learn more in this Denver Post story. Thank you to all employees, families and partners who joined us to “make change happen” in our communities this year!